As of 1st January 2019 new diesel and LPG powered forklift trucks sold in the European Union will start to have to comply with Euro-Stage V. The standard will almost certainly be adopted here too. So what will this mean for those planning their forklift truck fleets? Should buyers be reconsidering their fuel or power options? Possibly, but there are a number of important considerations. The headline news is that limits on emissions of particulate matter are to be reduced by a further 40% – taking the current Stage IV A limit of 0.025 g/kWh of soot down to 0.015g/kWh – and this will apply across all engine sizes. Carbon Monoxide emissions will be set at 5.0 g/kWh for all engines up to 128kW and emissions for NOx and HC will remain as currently specified. Although the new standards appear simpler, for buyers of forklift trucks life is about to become more complex. Under Euro-Stage V standards all IC engine trucks, both diesel and LPG, will have to comply regardless of engine size – even those below the current minimum threshold of 37kW. For the first time, the Euro-StageV legislation affects LPG and Diesel engine emmissions. For LPG trucks, emissions of particulate matter will not be a problem, but to eliminate nitrous oxides a three-way catalytic converter will be necessary. The good thing is they are relatively inexpensive. The biggest impact of these new standards will fall on diesel models, most of which already require diesel particulate filters (DPFs) to comply with current standards. With the introduction of more stringent Euro-Stage V regulations significantly more advanced DPF cleaning systems and operating regimes will be required by most manufacturers to comply, meaning even more downtime and expense. 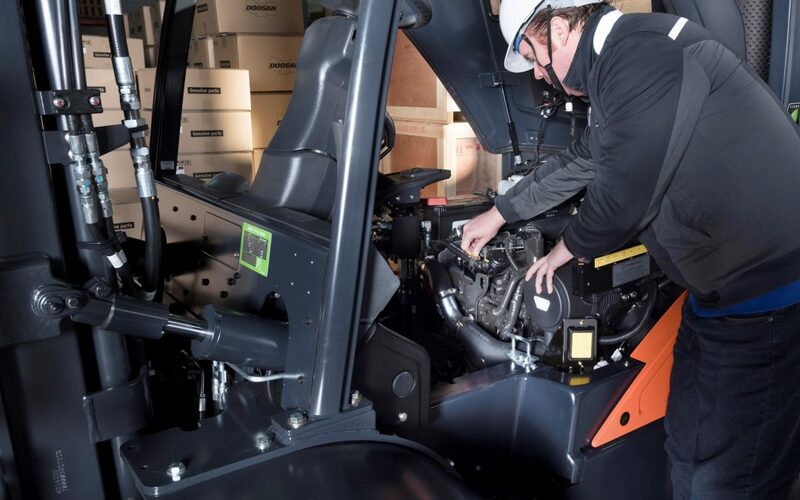 Most forklift makers adapt ill-suited automotive engines and reduce the amount of NOx by lowering the combustion temperature using cooled exhaust gas. But, there is a big penalty. Soot is increased which is why a DPF is needed. The problem is, a DPF filter must be recharged once or twice a week – requiring the truck to be taken out of service and the engine revved at full RPM for about 20 minutes. 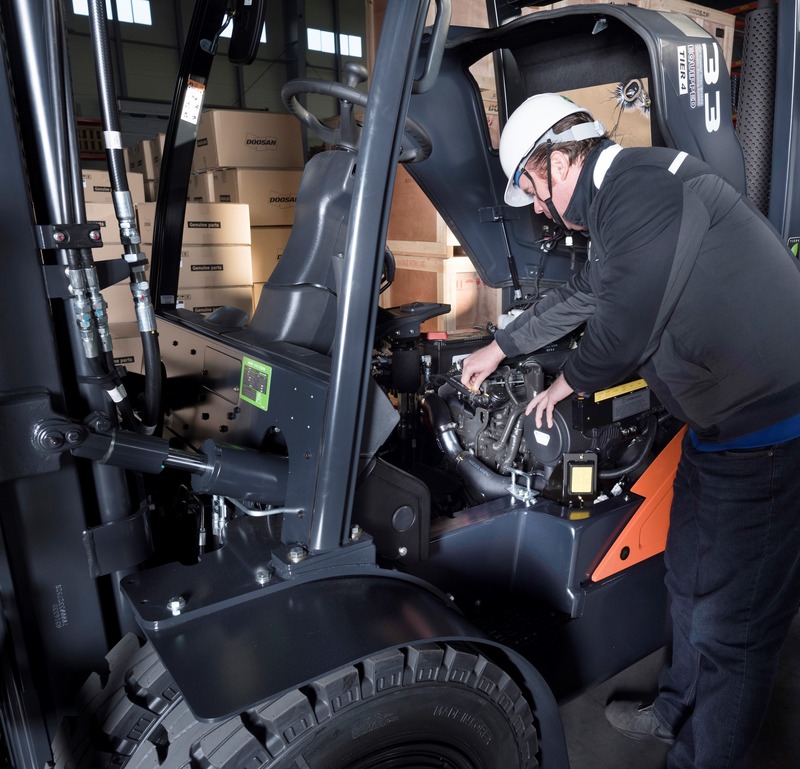 However, some forklift truck manufacturers use diesel engines that do not require DPFs to comply with existing Euro-Stage lllB and Stage lV standards. Doosan has a full DPF-free range from 2.0-tonne capacity across all diesel powered counterbalance trucks up to 25-tonnes. Of course, with stricter regulations even these manufacturers will need to further reduce emissions by fitting DPFs. However, Doosan will only need a very small DPF to comply, as the in-house designed G2 engine is already exceptionally clean. Tests on G2 engines at Doosan’s Infracore Engine Division show that effective cleaning of the filter is achieved in normal use – similar to a diesel car – so no costly down time. Clearly, tightening EU regulations on emissions point to the direction policy makers wish to take. So, as with cars and vans, is the future electric? Electric trucks have a lot to offer. In 2016 Doosan launched a range of 48v electric trucks up to two tonnes and in early 2017 an 80v range from 2.5 to 3.5 tonnes. Later in 2018 the five tonne electric series will be revamped and six, seven and eight tonne electric models will follow suit. However, there are plenty of applications where diesel or LPG trucks offer the best solution. If you are looking for expert advice on how the Euro-Stage V standards might affect your business, We can offer you a balanced view. If you want to find out more about our fuel efficient, low emission engines, contact us now.